I made a mistake on the movment serial number, it's 152244, sorry. cannot find any info for this watch online any where. Could you please photograph the inside of the case and the back of the case please. Case SN and movement date code give us a date of 1930. This has the exact dial of a Miss America, but a different case engraving and no "gems" on the bezel. Miss America ad from 1930. What is engraved on the inside case back? Could you provide a pic of inside case back or give us the info please. Case SN and mvnt symbol suggest 1930, what ever model it is. I'm guessing the entered production date of 1924 is based on the first patent date for the "dust tite" movement cover, and we simply can't see that patent info on the inside case back. Inside the case reads. 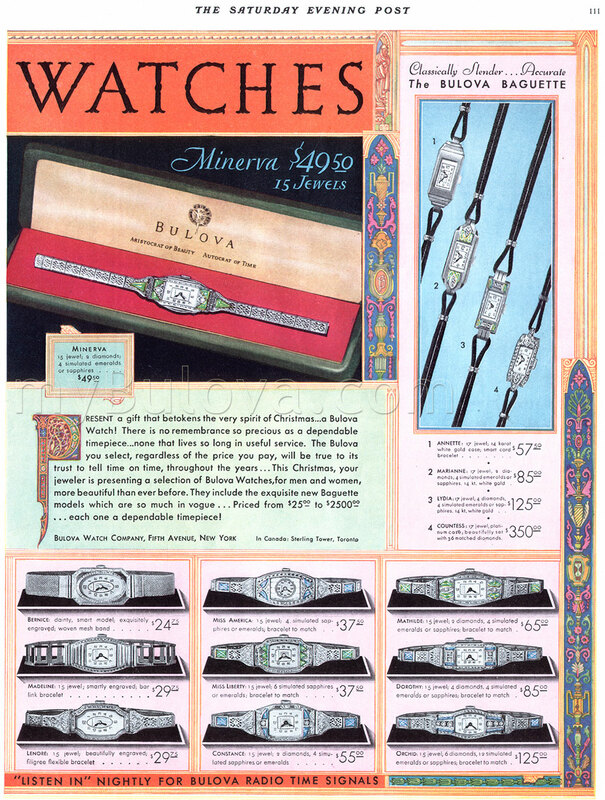 Bulova Quality,(oAo) pat june 10 1924 0325464. with a date scratched in most likely by a jewler 05-02-1938. I uploaded some pics of it. It's a beauty. 1930 Unknown model name for now.